The autumnal tints that starts from Hokkaido’s Taisetsusan range in mid-September reaches Kyushu region in about a month and a half. 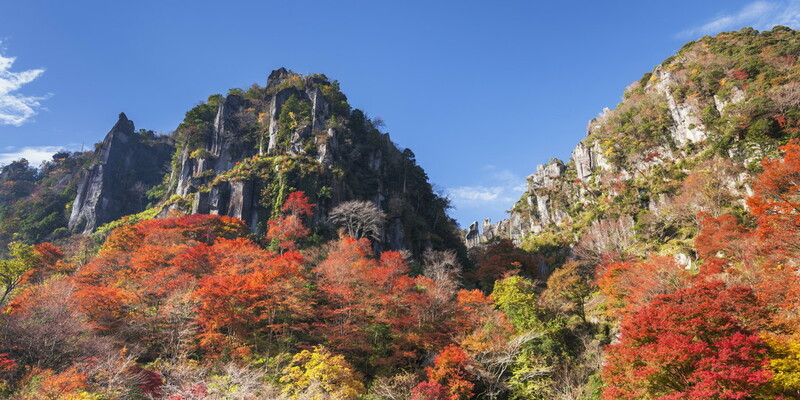 The mountains and gorges in Kyushu enjoy warm climate, enabling the creation of deep forests composed of diverse vegetation; thus, Kyushu’s autumnal tints are colorful and vivid. You will find a lot of wild landscapes peculiar to volcanic zone such as cliffs and lava domes; their complicated topography becomes a grand stage of autumn colors. Takachiho, located between mountains in northern part of Miyazaki, is a divine land of Japan, famous as setting of mythology such as Ama-no-Iwato legend. 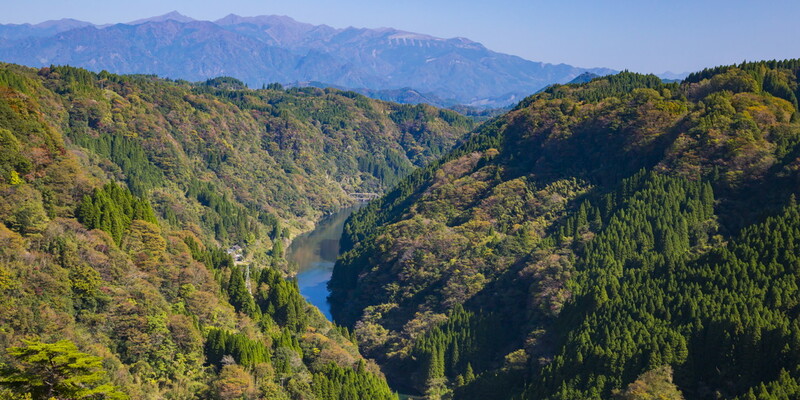 At V-shaped valley created by Gokase River, you will find Takachiho Gorge and Manai Waterfalls, both renowned as prominent scenic spots within Takachiho region. At the valley in autumn, maple and beech leaves add mellow pigment to Manai Waterfalls that flow mystically. The scenery of autumn represented by cliffs made of columnar joints, the renowned waterfalls, and autumnal tints is gorgeous whether looked up from a boat or looked over from Mihashi bridge, the location offering fine view. Precipitous cliffs of Takachiho Gorge is about 7 km, and their exceptional and peculiar beauty is designated as national treasure and beauty spot. Yabakei Valley is known as one of Japan’s three major rare scenic spots because of its imposing landscape created by oddly shaped rocks. In Taisho era, this place was selected as “Japan’s New Three Major Scenic Spots” along with Hokkaido’s Onuma and Shizuoka’s Pinery of Miho. 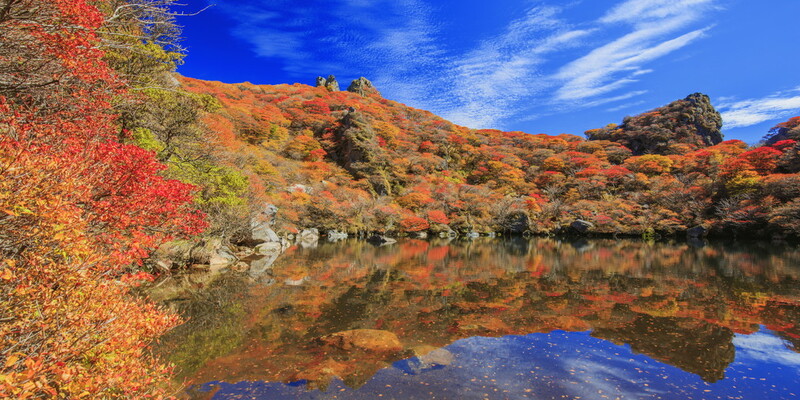 Yabakei Valley is divided into several sections, such as Hon-Yabakei, Shin-Yabakei, Ura-Yabakei, Oku-Yabakei; however, the most renowned area to enjoy autumnal tints is Shin-Yabakei. From the observatory called “Hitome Hakkei (Eight scenes at a glance)” you can look over eight oddly shaped rocks such as Mt. Gun-en and Meoto-iwa Rock at a glance. In autumn, titanic, towering rocks are decorated with colored leaves of maple and gingko trees; thus, this place of brocade-like autumnal tints is known for autumn’s scenic spot representing Kyushu. 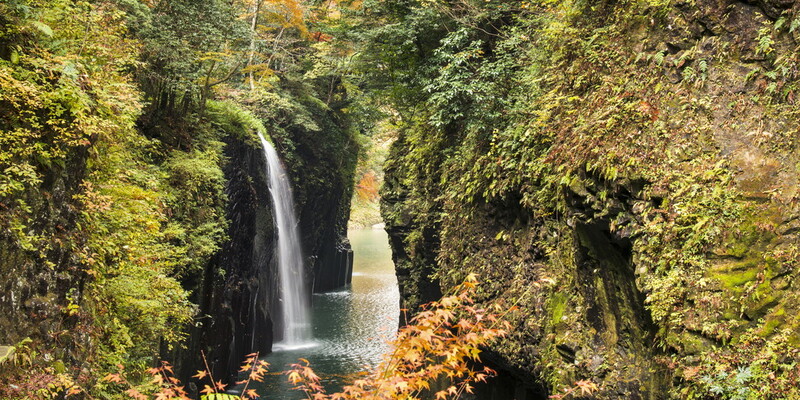 After leaving “Hitome Hakkei” to walk the promenade about 1.5 km long, you will see up close the dynamic landscape composed of cliffs, waterfalls, and autumn leaves. Also, “Hisashi Momiji Namiki,” an avenue of maple trees near the parking lot along prefectural road #28, will be beautifully illuminated in line with the season of colored leaves. Kuju Mountain Range consists of clusters of mountains stretching 10 km from north to south centering on Nakadake, the highest in Kyushu (elevation 1791 m) and mountains such as Kuju and Ofuna. 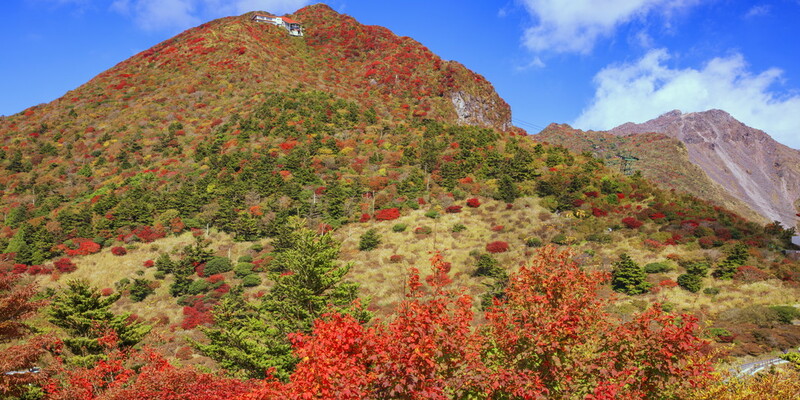 This string of ten-odd imposing mountains is called “Roof of Kyushu.” In autumn, leaves of rowan, maple, enkinathus, wax tree and such color the vast surface of the mountains in red and yellow, while at Kuju Highland in the foothills, you will see whole area covered in golden carpet created by Japanese pampas grass. You can enjoy a refreshing drive at “Yamanami Highway” which stretches to the foothills while watching the panoramic view of Kuju Mountain Range. This place is also a famous hiking spot; among the various trail routes, the route to Mt. Ofuna and Kuju (one of Japan’s Top 100 mountains) are popular. The autumnal tints of the highland where underbrush and shrubs turn bright are breathtaking. A splendid valley at the highlands connected to somma of Aso, in upstream Gokase River. It is a U-shaped valley which is quite rare in Japan, created by pyroclastic flow scraping off the ground over time after Mt. Aso erupted intensely. 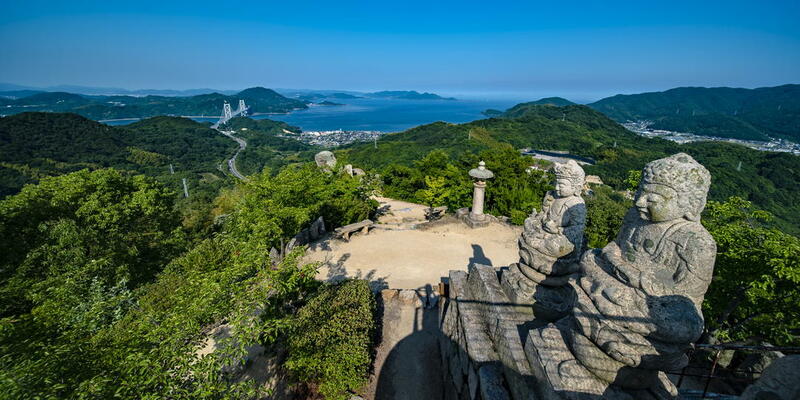 About 200 m tall cliff stretches for about 10 km, and the majestic landscape you can look over from Nagasaki-hana observatory--the vantage point--is called “Kyushu’s Grand Canyon.” The place is equipped with a promenade that stretches along the gorge from Nagasaki-hana observatory, enabling you to walk the deep forest of maple, Japanese zelkova, beech, and such in autumn colors. The surface of the gorge is dark, and the maple leaves’ red stand out against the dark facade with columnar joints. Unzendake is a comprehensive name for over 20 mountains including Mt. 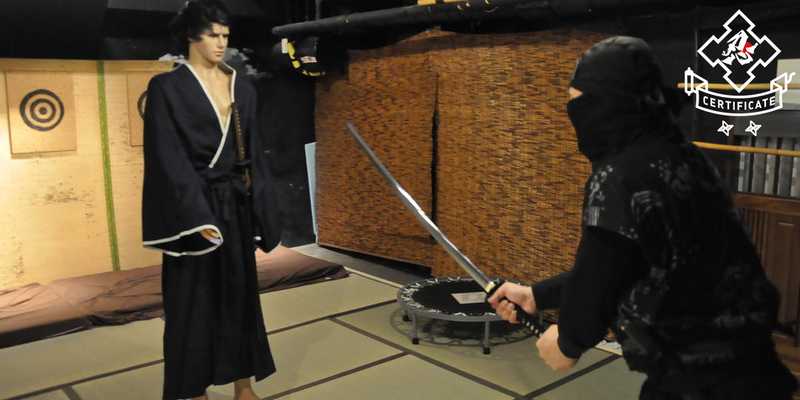 Fugen and Heisei Shinzan. 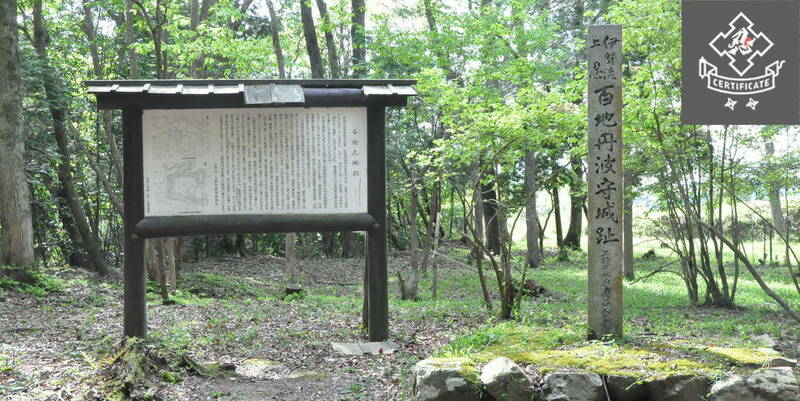 This region, centering on Unzendake, was the first National Park designated in Japan. In Unzen, there are over 120 species of trees that change colors in autumn; the richness of pigments is regarded as the best in Kyushu. 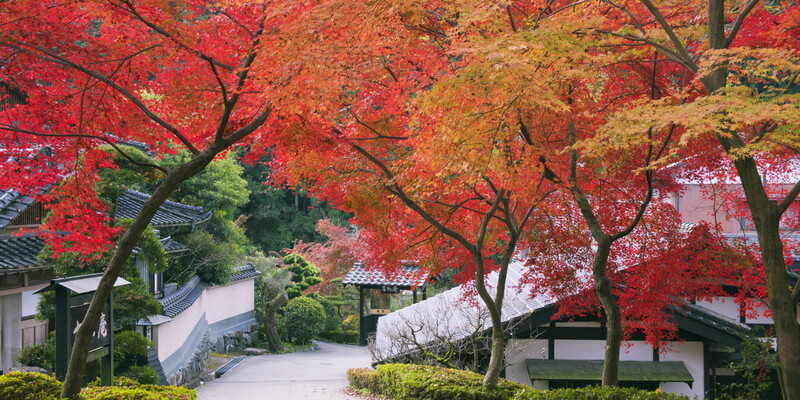 On a hillside gushes hot springs of Unzen where you can watch the autumn scenery of Unzen from spa district. Within the spa district is Unzen Jigoku (Hell), where volcanic gas rises; the gas ceaselessly rises from about 30 locations with terrestrial heat. Unzen Jigoku is equipped with a promenade where you can make a round trip in about 30 minutes. From the promenade beyond the “hell” enveloped in steam, you can see the panoramic view of the mountains decorated with autumnal tints. It is also a good idea to visit Nita Pass and Unzen Ropeway using spa district as a base. Nita Pass, with elevation of 1100 m, is a perfect vantage point to look over the autumn leaves of Unzendake. From the observatory, you can gaze at Mt. Fugen, Heisei Shinzan, as well as distant Ariake Sea. This is where Unzen Ropeway departs and arrives, so you can enjoy a walk in the sky (one-way three minutes) from Nita Pass to the top of Mt. Myouken, part of the volcanic group of Unzendake. Around the summit of Mt. Myouken are a variety of maple and enkianthus cernuus growing in colonies, presenting a beautiful gradation of yellow and red. The view from the summit is also amazing, enabling you to look over Amakusa Archipelago and distant Kirishima between the sea of clouds. The entire forest is called “Mt. Fugen’s broad leaved forest,” and designated as National Natural Monument; autumnal tints created by a variety of trees and the amazing panoramic view will make you lose track of time." 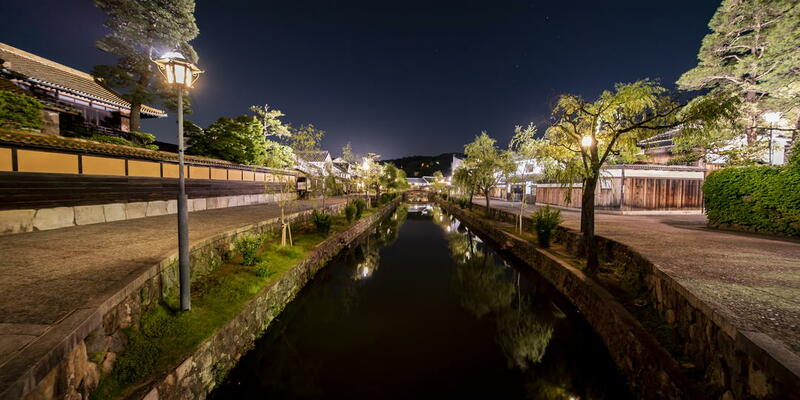 Akidsuki is a charming town, still leaving the impression of castle town, and it is called “Little Kyoto of Chikuzen.” It is designated as important preservation district of historic buildings of Japan, and castle ruins and samurai residences are carefully preserved. 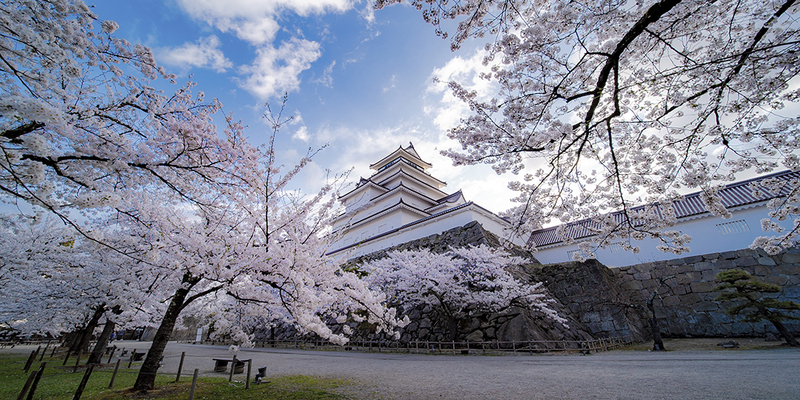 Akidsuki Castle belonged to Akidsuki clan who ruled the area since Kamakura era, and Kuroda clan who became the feudal lord from Edo era; it is a pedigree castle. The citadel is long gone, but there still remains the main gate, which is also called Kuro-mon. In the surrounding area, colonies of maples show off their red color as if to compete with each other, creating a spot for autumnal tints with a quaint taste of an ancient town. The contrast between the black of Kuro-mon and red of maple leaves is stunning; you can enjoy exploring the history enveloped in beautiful leaves while pondering the glory of feudal government period."